Home Featured Politics THE 9TH SPEAKER OF THE HOUSE OF REPRESENTATIVES SHOULD BE A MAN OR WOMAN WITH NO IOTA OF BAGGAGE IN ALL RAMIFICATIONS. THE 9TH SPEAKER OF THE HOUSE OF REPRESENTATIVES SHOULD BE A MAN OR WOMAN WITH NO IOTA OF BAGGAGE IN ALL RAMIFICATIONS. The incoming Nigeria Parliament i.e., the 9th Assembly will be saddled with an ever increasing citizen demand and expectations, there will be demand for progressively higher standards, in philosophy, principles and practice and the parliament must consciously seek to meet up with these obligations. The 8th Assembly going by history, witnessed and contended with some environment dictated realities and a few people have traded blames, however, the reality today is that a new assembly is about to come on stream and will naturally be confronted with its own topical dynamics and realities, but the interest of our constituents, constituencies will forever remain paramount and that is one destination that all stakeholders believe the parliament must arrive at alongside others in the 9th Assembly. With the defined expectations, it is clear that a relational personality will be central to the accomplishments of the intents and purposes of the next level leader of the 9th Assembly House of Representatives. These expectations will call for a personality, with fresh background, and spring season credentials, a bridge between generations, and a nexus for all. I therefore present to you, the Member representing the people of Chachanga Federal Constituency, a third-term member of the house, the versely intelligent 45 years old man, Hon. Muhammed Bago, a seasoned legislator, a man with pedigree and the next speaker of the House of Representatives. Hon. 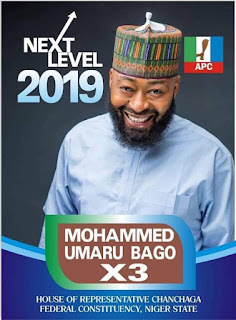 Muhammed Bago graduated with a degree in Political Science from the Usman Dan Fodio University, Sokoto, Holds a Post Graduate Diploma, Masters Degrees in Management, Business Administration, Finance, an alumni of Cambridge University, a former Banker at CBN, UBA, STB, FCMB, AND AFRIBANK. He was elected into House of Representatives in year 2011, and same year, he was member of Committees (Banking and Currency, Appropriations, Education, Internal Security, Information and Communications Technology, Defense, Loan and Debts, National Planning and Economic Development, Media and Publicity, Civil Societies and Donor Agencies and Police. Other committees he had chaired are, Committees on Maritime Safety, Education and Administration and in all of these, has been without blemish or wrinkles. According to him, “We all represent the mutual bond that binds us as members of the second arm of government and we will be strengthened through the instrumentality of quality leadership which I am here to represent” and to the President of the Nation, I commit unreservedly to a parliament particularly the House of Representatives that will truly be the House of the Nigerian people, progressive inclined, responsive and responsible where Nigerians will come first. The House of Representatives under my leadership will be sensitive, pragmatic and not self-serving. To our dear party, the All Progressives Congress, (APC); the house will reflect the ideas, ideology, identity and values as espoused by the leader President Mohammed Buhari GCFR in the context of mutually desirable benefit and help to meet the promises made to Nigerians. The House of Representatives will reinforce confidence in democracy in alignment with the vision of a new Nigeria in the hands of the party as to be actualized by the executive led by the President. The House of Representatives will be available to support the introduction of a systemic, integrated legislative framework in support of the fight against corruption, insecurity and revamping of the economy, these three pronged focus of President Buhari’s administration. Our activities will include concerted attention and work on the budgets will be realistic and people’s need driven.